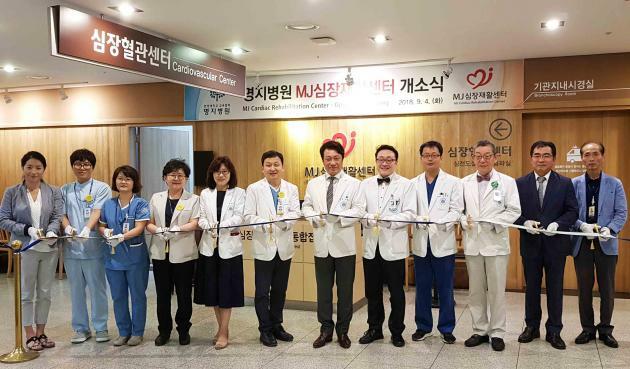 Hanyang University Myongji Hospital (HUMH) said Wednesday that it has opened MJ Cardiac Rehabilitation Center, which specializes in rehabilitation programs to prevent the recurrence rate of heart disease patients. Myongji Hospital CEO and Chairman Lee Wang-jun (seventh from left) and other hospital officials cut a ribbon to dedicate the MJ Cardiac Rehabilitation Center inside the hospital in Goyang, Gyeonggi Province, Tuesday. The center plans to provide education and personalized exercise programs for patients, who underwent heart or pulmonary surgery to improve cardiopulmonary function, which in turn will help prevent recurrence and mortality after treatment. The hospital also intends to introduce special programs such as psychological stabilization and music healing as cardiovascular patients fear recurrence and complications. The center, led by the hospital’s rehabilitation department, will include rehabilitation center, cardiology department, thoracic surgery department, mental health department and family medicine department. Interdisciplinary care teams, such as the nutrition team, art therapy center and IT fusion research institute, will also support the center. The rehabilitation program identifies and corrects individual patient's risk factors for heart disease, and improves cardiopulmonary performance by step-by-step exercise therapy. The program also includes an integrated management program to help educate patients about correct dietary habits. Besides, the MJ Cardiac Rehabilitation Center plans to develop a program for managing individual indicators, provide a diary to patients so that they can oversee their healthcare and a sourcebook that contains information about cardiac rehabilitation training and management. The hospital will also provide patients with various other services, such as free consultation, smoking cessation education, and obesity management programs. HUMH plans to award certificates to patients who have successfully finished the program to encourage participation.